It’s going to be a very hot day. I am not complaining. I am sitting in my backyard in the early morning sunshine, a cup of tea in hand. I am having it now before it becomes too hot to enjoy it, listening to the Barred Owls hoot: “Who cooks for You?”. Yes, they do actually call to each other early in the morning, much to the consternation of our sons, who are late sleepers. I stretch my stubby little bare toes out wide in the luxury of warmth and realize my shoulders are not up around my ears. Summer has finally arrived. We spend so many months of the year here in Vancouver hunkered under umbrellas, that when the sun makes its appearance, we all rush outside gazing up at the yellow ball in the sky to soak it up before it disappears. I do realize that I am fortunate to live in this beautiful province full of tall conifers and green ferns, provided in large part, by the massive rain fall, and perhaps that’s why I appreciate summer so much. 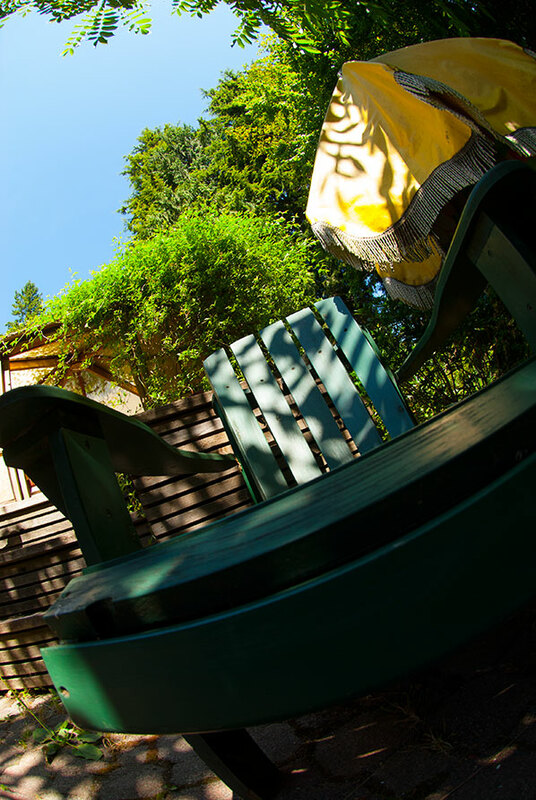 Staying in the Adirondack chair the whole day seems like a very good idea, especially if accompanied by a large book and enough liquid to keep me hydrated, but as I sit here with my eyes closed, the aroma of sun ripened fruit wafts into my nose, that unmistakable “baked fruit” smell, and a vision of raspberry and chocolate tempts me from the chair – not elegantly, I do confess – it is hard to get out of an Adirondack chair elegantly when one is as short as me: it involves all four limbs. The last thing I want to do on what is going to be such a hot day is to temper chocolate, but I am craving the taste. 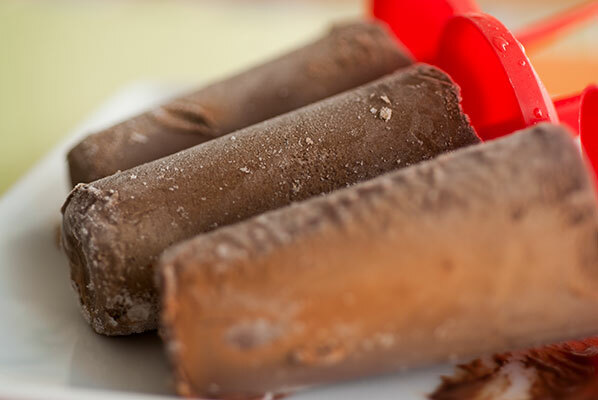 One chilly and delicious solution: chocolate popsicles. As a child, peering into Mr. Lee’s corner store deep freezer, I never chose the freezer-burned, messy and, to my mind dirty brown messes on sticks, known as Fudgsicles. I considered them “not even really” chocolate. A quick check of the list of ingredients on the mass produced bar lists “cocoa processed with alkali” (Dutch processed) as its eighth ingredient and its only chocolate one, after palm oil, so perhaps that was justified. My horribly snobbish opinion of them was reinforced by an unfortunate boy of my acquaintance who ate them often, and pronounced their name as “Fudg-icles”, the melting brown sludge gleefully smeared around his mouth. This unfortunate classmate also pronounced the word mirror as “meer”, had sweaty hands and was a rock thrower, so I was determined not to like them – I did mention I was a horrible snob as a child, didn’t I? But I always loved homemade fruit popsicles, especially the satisfying slurping noise they make as they slide out of the mold, a hint at the juicy goodness to come. And I do love a chocolate covered ice cream bar. Oh, and a crunchy bittersweet chocolate granita, mmm. So I think, with a bit of ingredient tweaking, I can learn to love the Fudgsicle. And a quick search of the internet reveals how popular the Fudgsicle is. There are many recipe variations, but I particularly liked the sound of Megan’s (essentially a frozen ganache) at Take A Megabite. After making the recipe, and filling a half dozen 3 ounce popsicle molds 2/3 of the way, with the ganache mixture, I left them to cool to room temperature while I made a raspberry puree to ripple through them. I would recommend using frozen, thawed berries if you don’t have the luxury of getting them out of your back yard garden. My dear partner’s berry bushes are glistening with the fragrant fruit that wafted across my nostrils and started this whole post, so I will be getting mine from out the back door. 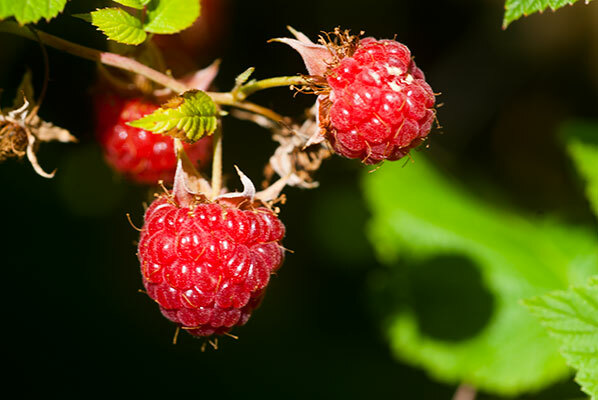 Frozen berries are usually packed with flavour, as they are flash frozen at their peak of ripeness. For this puree, you are mashing and heating them, so the frozen berries actually break down as well as, if not better than, the fresh. We found that the dark chocolate was quite intense on its own. I think next time I would use a chocolate of 60% cocoa content (the one I did use was 72%). The raspberry ripple really made it for me, and the sweet/tart flavour of the berries balanced the intensity of the dark chocolate really well. Also on Megan’s website is a recipe for dairy-free fudgsicles, using coconut milk. I was grateful to find this. Elder Son’s dear friend has Celiac Disease and cannot eat wheat gluten or dairy products, so these days I always have a weather eye out for recipes she will be able to enjoy with us. I love anything made with coconut milk, and I found these even tastier than the dairy version. Next time I will ripple them, as well! The recipe made 8, using a 2 ounce popsicle mold. 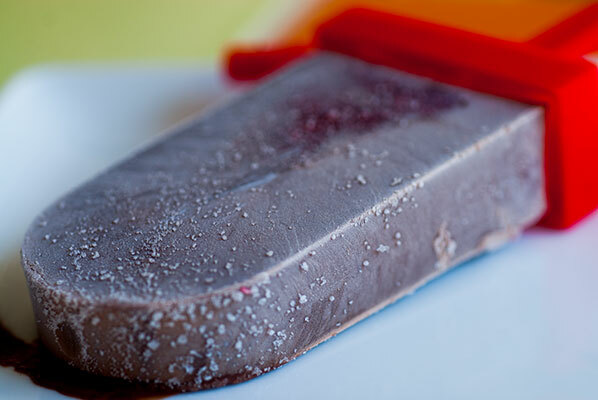 Since I had one more popsicle mold left, as well as leftover heavy cream and thinking “In for a frozen penny, In for a Pound”, I made another slight variation, using the original recipe, but using 1 teaspoon cocoa, 1 teaspoon cinnamon and one teaspoon sugar, instead of 1 Tablespoon cocoa. These were also tasty, and next time, I would try adding some liquid coffee to replace some of the milk. All three of these Fudgsicle recipes came together in under an hour, and were in the freezer by the time the first sleepyhead made his appearance for the day. So, my apologies to the long maligned (by me) Fudgesicle. Which just goes to show that people can change – myself, I mean. I hope I am not as stuck up as I was as a kid. … as long as he’s stopped throwing rocks.